the Graveyard. A Tale of Tales. 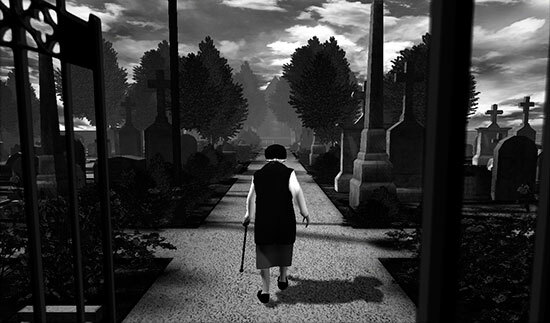 Download the free Trial version of The Graveyard. Mac: OSX 10.7 or newer, with Radeon or GeForce video card (G5, iMac, Mac Pro, MacBook Pro), keyboard or joystick. Windows PC: XP or newer with Radeon or GeForce video card (no integrated graphics), keyboard or joystick. iPhone/iPod Touch or Android device. Get The Graveyard song: "Komen te Gaan" by Gerry De Mol on bandcamp. For comments, questions and discussion, please visit The Graveyard forum. Read more about the development of this game in The Graveyard Postmortem.